Located in the heart of Hillsboro VillageÂ NSAGÂ is the smallest functioning art gallery in Nashville, and dare we say, the world! The art is real. Really small, but real. 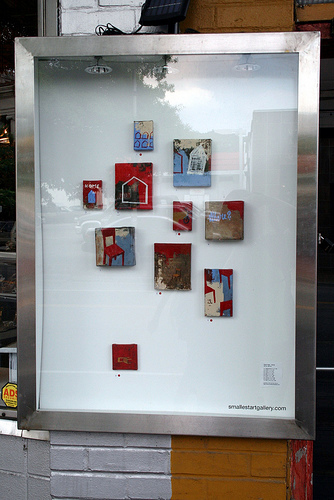 The gallery is already attracting some of the top artists from around the US, as well as local Nashville artists. In a former life, the gallery was a neglected, graffiti-covered display case. Soon with a little help from some Goo Gone, a razor blade, and a total interior makeover, the gallery started to take shape. The gallery lights are powered by a solar panel mounted to the top, making it the only 100% self-sufficient art gallery in Nashville (and again, perhaps the world).